Attention TriMet riders — don't stop paying your fares yet. Although a Multnomah County Circuit Court judge has ruled one fare inspection was unconstitutional, he also said all riders have to buy tickets, and the regional transit agency is still checking for them. Confused? You're probably not alone. TriMet General Manager Doug Kelsey defended fare checks as "very lawful" at last Wednesday's board of directors' meeting. But the ACLU of Oregon argues the ruling should apply to all random checks. And 13 Democratic state legislators have asked Oregon Attorney General Ellen Rosenblum to not appeal the ruling, siding with the ACLU. "A policy of sweeping fare-enforcement searches violates the constitutional rights of transit riders," said the letter, which was spearheaded by state Rep. Diego Hernandez of Portland. "This practice exacerbates disparities in the criminal justice system and contributes to the over-policing and over-prosecution of people of color, people with disabilities, and people experiencing homelessness and other forms of economic insecurity." TriMet spokeswoman Roberta Altstadt said that while the agency evaluates the ruling and makes adjustments, "fares are required on all TriMet buses and trains, and riders should be prepared to show a valid fare when requested by a TriMet employee." In fact, the Sept. 20 ruling by Judge John Wittmayer said TriMet does not discriminate when conducting fare-enforcement missions. "When TriMet fare inspectors conduct a fare-inspection mission (including when assisted by police officers) at the MAX platform, they always ask for proof of payment from every passenger exiting the train. They do not discriminate in any way in selecting whom to ask for proof of payment — they ask every existing passenger," the ruling says. But the stop at the center of the court case was more complicated. According to the chronology in the ruling, Parkrose School Board member Rosa Giovanna Valderrama was a passenger on a MAX train that stopped at the Old Town/Chinatown station, where TriMet was conducting an enforcement mission with the assistance of Portland police. A fare inspector asked her for proof of payment when she left the train, and saw her then activate an e-ticket on her mobile phone, indicating she had not paid her fare before boarding. According to TriMet, after the arrest, an officer found Valderrama's driver's license in her purse with the name "Rosa Valderrama." She had provided that license to a TriMet employee when she was cited for fare evasion while riding a MAX train 12 days earlier. Valderrama challenged the charges and was represented by the ACLU, which filed a motion to suppress the evidence against her. In his ruling, Wittmayer laid out four conditions that must be met for such a stop to be administratively valid, and said that it failed to meet two of them. First, he said prosecutors did not convincingly argue that the Oregon Legislature authorized TriMet to conduct such stops when it created the agency. And second, he said the presence of the police officers threatened immediate criminal charges, not merely civil penalities, for violations. "The seizure of defendant does not satisfy all the requirements of a valid administrative search," the ruling says. But TriMet worked with the 2017 Oregon Legislature to de-criminalize some fare evasions, suggesting state lawmakers did not believe random checks were unconstitutional at the time. If the ruling is interpreted as preventing all fare-inspection missions, TriMet is facing a serious problem. Fares are a significant source of financing for the agency. They are expected to produce 17.6 percent of all revenues this year, the second-largest share after the regional payroll tax. But the MAX system was not designed or built to require all riders to present proof of fares before boarding the trains. Unlike on buses, riders do not pass by drivers who make sure everyone has paid. Instead, except at a limited number of stations, MAX riders simply walk onto the trains from a sidewalk or open boarding platform. TriMet was having fare collection problems even before the court ruling. 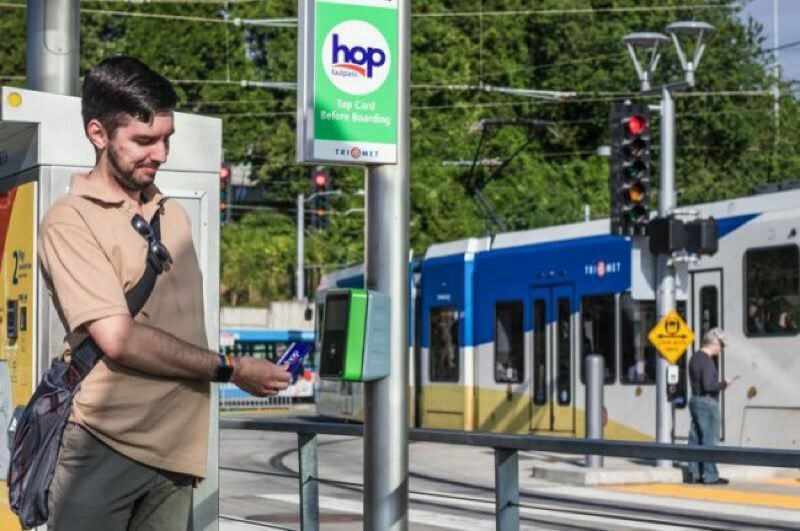 A Portland State University study released in August said that fare evasion on the MAX system increased from 14.5 percent in 2016 to 16.6 percent in 2018, costing TriMet an estimated $7.8 million a year in lost revenue. TriMet was not actually a party in the case. It was between the state of Oregon and Valderrama. But because Rosenblum represents the state, she must now decide whether to appeal Wittmayer's ruling. In a statement, she said her office is reviewing the ruling and will discuss it with the district attorney's office to determine whether there is "legitimate basis for appeal." You can read the legislators' letter here. You can read the ruling at http://tinyurl.com/y7pyt643.